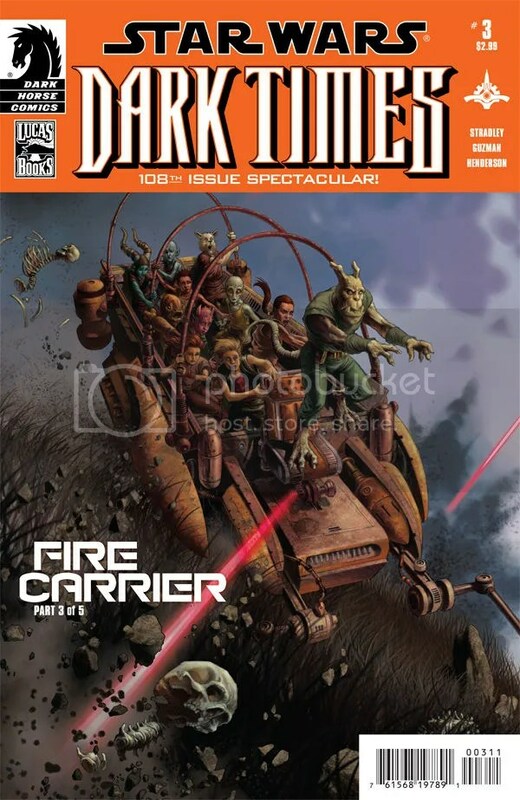 The fun continues in Dark Times: Fire Carrier #3 as Jedi Masters K’Kruhk and Zao are forced to flee from their horrific discovery with the younglings in tow. Meanwhile the role of the Imperials develops a bit further as new details immerge. It seems Captain Teron has a bit of a history with K’Kruhk, one that would cause him to go above and beyond the call of duty. With decent artwork, an action packed story and a few moments of humor, Fire Carrier #3 lays out a pretty good issue. One thing I liked about this issue was the way it plays with the readers emotions. Fire Carrier #2 ended on a pretty dark note. I didn’t think it could get much worse than the Jedi coming across a gorge full of dead refugees. However Randy Stradley proves that just when you thought it couldn’t get any worse, it can. How? Why it’s as simple as dumping off a new batch of refugees. I didn’t realize how much more horrific it would be to actually see the helpless refugees fall to their deaths. To really top it off, the Jedi and the younglings are forced to watch just as helplessly, witnessing the tragedy both visually and through the Force. Thankfully Randy got all that darkness out of his system at the get go so readers can look forward to less violent storytelling for the rest of the issue. What may be surprising to hear is that there’s actually some humor in this issue. The captured assassin Sang tries rubbing Lieutenant Gregg the wrong way only to get ambushed by a four armed droid who looks like he wants to wrestle. I also thought it was kind of amusing when the blind Master Zao does a faceplant when the runaway hover wagon slams into a tree he probably couldn’t see. It’s not much, but when the issue starts off so low, you’re sort of desperate to cling to some kind of humor to bring you back up and out of the depths. It’s an interesting one-two punch style of storytelling juggling humor and horror. Between the high and low of the story is a healthy dose of action as aerial pursuers chase the Jedi around and blast at them from up high. The artwork does a good job of conveying the action as well as expressing the emotions on the characters’ faces. From the shock and outrage on the faces of the Jedi to the smug faces of the militia and Imperials, there’s a good range of the spectrum. One page that really stood out was an innovative, vertically split panel of Master K’Kruhk as he uses the Force to bring a shuttle down. In the middle of the spit is a subset of panels showing the ship as it crashed down, while on each side is half of K’Kruhk. The left half as he concentrates, the right half as he brings it down. The visual juxtaposition is a neat way of conveying time, motion and emotion. The issue ends with an explosion and the impending arrival of an Imperial Star Destroyer. It’s safe to bet that there will be more explosions. Will the Star Destroyer blow up the militia’s ships? Will Jedi get caught in the crossfire? Who knows. But Vader still has a hand to play as Captain Teron is certainly overplaying his own. This could lead to a mission for Vader’s new toy: the assassin Sang. It’ll be neat to see if and how that plays out. Regardless, Fire Carrier #3 had some good stuff. I liked the art and I liked the story. I think it earns a five out of five metal bikinis.